Trippermap.com is a web service that allows you to put a flash based world map on your own website or blog. Trippermap will then automatically search your photos at Flickr for location information and plot the photos on your own Trippermap, on your own website. It's as simple as tagging your photos with a city and country name! Trippermap also supports photos that have been geotagged or photos that have location data encoded in their EXIF properties. Trippermap now supports Flickr's new mapping tools so you can drag your photos onto the map at Flickr and have them show up on your Trippermap and then see them using Google Earth. 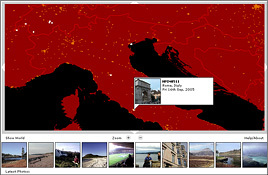 Our Google Earth Geotagger now also updates your map at Flickr straight away so if you need more detailed maps while geotagging your photos check out our video tutorial. It only takes one click to geotag Flickr photos using Google Earth. Trippermap = Flickrmap. Due to trademark requirements we've updated our name to Trippermap which reflects out focus on travel photography and mapping all the great trips you've been on. Change the size of your Trippermap just by changing the width and height in the HTML code on your website. Create a custom colour scheme to match your website design. Any of the map layers like roads, lakes, and cities can be turned on and off as well as given a custom colour. Ever tried to use Google maps with more than a hundred locations? It crawls! Because Trippermap sticks to good old Flash it can easily handle 1000+ locations. Trippermap is based on VMAP0 which means you get city, road, lake and region detail for the whole world. 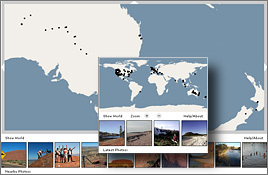 Don't have a Flickr account or want a copy of Trippermap to work with your own photo database? Check out the Flash Photoblog World Map that Trippermap is based on.